We present a theoretical framework and practical method for the automatic construction of simple, all-quadrilateral patch layouts on manifold surfaces. 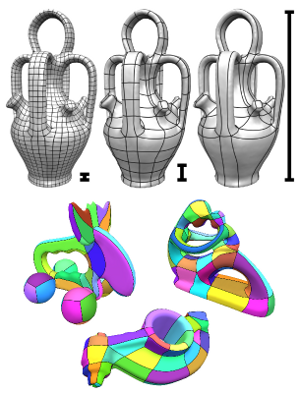 The resulting layouts are coarse, surface-embedded cell complexes well adapted to the geometric structure, hence they are ideally suited as domains and base complexes for surface parameterization, spline fitting, or subdivision surfaces and can be used to generate quad meshes with a high-level patch structure that are advantageous in many application scenarios. Our approach is based on the careful construction of the layout graph's combinatorial dual. In contrast to the primal this dual perspective provides direct control over the globally interdependent structural constraints inherent to quad layouts. 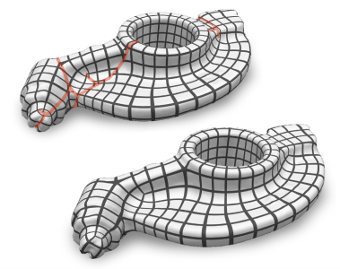 The dual layout is built from curvature-guided, crossing loops on the surface. 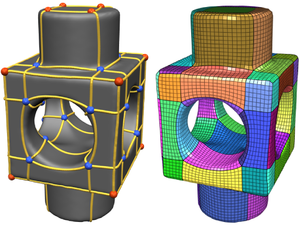 A novel method to construct these efficiently in a geometry- and structure-aware manner constitutes the core of our approach. We present a novel method for quadrangulating a given triangle mesh. 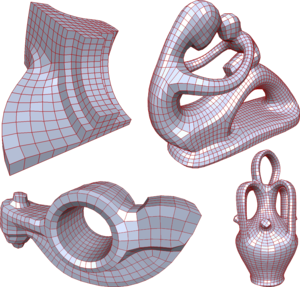 After constructing an as smooth as possible symmetric cross field satisfying a sparse set of directional constraints (to capture the geometric structure of the surface), the mesh is cut open in order to enable a low distortion unfolding. 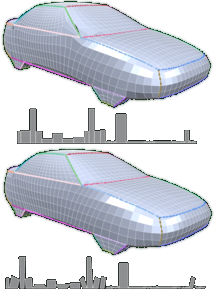 Then a seamless globally smooth parametrization is computed whose iso-parameter lines follow the cross field directions. 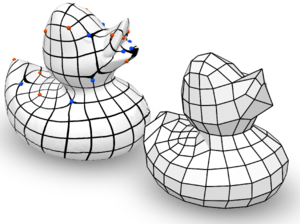 In contrast to previous methods, sparsely distributed directional constraints are sufficient to automatically determine the appropriate number, type and position of singularities in the quadrangulation. Both steps of the algorithm (cross field and parametrization) can be formulated as a mixed-integer problem which we solve very efficiently by an adaptive greedy solver. 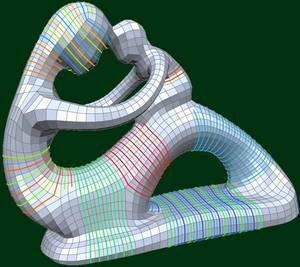 We show several complex examples where high quality quad meshes are generated in a fully automatic manner. The Constrained Mixed-Integer Solver used in this project has been released under GPL and can be found on its projects page.